This week’s blog is taken from the May/June 2017 issue of Workamper News. The theme for that magazine was Workamping Outside the Box. Stories from that issue included Workamping at a gun range in NV, a golf course in SC, acting as a train robber and riding horses in CO and then we have Geoff Baker and his wife Laura who worked at Disney World. Geoff was a bus driver and Laura was a photographer. Let’s see just how interesting it is Workamping at the happiest place on earth. My wife, Laura and I have been full-time RVing since August of 2011. After travelling the country for 6 months, we settled in Clermont, FL as a base of operations. We rented a site for 3 years before buying our own RV Lot at a luxury RV Resort. It is a place to call home, a domicile and a base of operations where we travel from and return to. We are about 12 miles from Walt Disney World. We own a 2001 Newmar Mountain Aire diesel pusher with upgrades including a residential fridge, flat screen TV’s, recliner chairs, swivel task chairs at the table and a Sleep Number bed. Cocktails for 6, dinner for 4, sleeps 2! Laura works full time as a photographer at Walt Disney World Magic Kingdom and I drive one of the Disney buses taking guests to and from the resort hotels to the theme park (Part Time). We meet many wonderful people, both those at the RV Resort and at Walt Disney World. I feel I am on vacation every day as we wake up to the beautiful Florida weather, eat breakfast outside and just relax. We have access to any of the Disney Parks for free as part of our compensation package. We really enjoy EPCOT’s Food and Wine Festival and the way all the parks and resorts decorate for the festive holiday season. We see/hear fireworks every night! One of the great benefits is a significant discount at Fort Wilderness Campground, where we go for a few days several times a year. I also run a small company inspecting RVs. Many of my clients are first-time RVers, planning on going full time as they retire. They are typically out of town and ask me to inspect a prospective RV they found on the internet. In one case, the clients were from Sacramento, CA. I inspected an RV for them, they bought it, I got them a Family and Friends discount at Fort Wilderness and then met them there for a 2 hour “Know Your RV” introduction and training. We would not buy another “Sticks and Bricks” dwelling. We love our life. Thank you for sharing, Geoff! 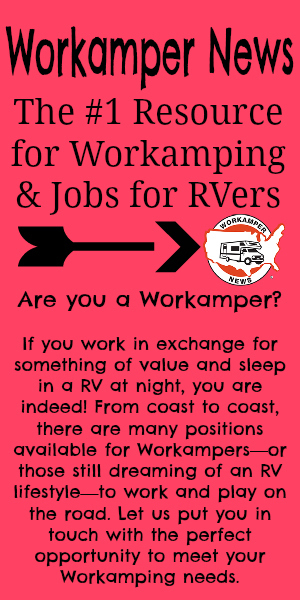 How to Enjoy the RV Lifestyle Now – By Workamping!